A tremendous amount of research on Hopewellian societies in the Northern Woodlands of the United States has been conducted within the last decade. This article summarizes the main themes and directions of that current research and presents a general model of Hopewellian societies. Local communities appear to have been small in size and relatively sedentary; sets of these communities shared a greater sense of cultural identity within a lineage and possibly clan organization, with each riverine drainage system occupied by a mosaic of lineages. Each in turn was spatially centered on specific clusters of religious, nonresidential public architecture. Alliances were based on a number of historically shifting variables, including religion, kinship, politics, and economics. It is suggested that future research continue existing methodologies and analyses and consider new ecological, genetic, and ideological research as a means of adding greater local historic nuance to this general model of Hopewellian societies. I would like to thank the editors, Gary Feinman and T. Douglas Price, for extending the invitation to write this article. My bias of knowledge towards Ohio research is evident and undoubtedly some important research efforts have been omitted. Any omissions or errors in presentation are unintended and entirely my own. I have relied on the gracious input of many scholars in writing this article. I especially extend thanks to Jarrod Burks, Christopher Carr, Doug Charles, Bill Dancey, Ann Freter, N’omi Greber, Paul Pacheco, Bob Riordan, Mark Seeman, Al Tonetti, Dee Anne Wymer, and Rick Yerkes. Several anonymous reviewers also added constructive comments that helped shape some of my opinions. I also thank Peg Sattler and her crew at Ohio University’s graphics lab for producing Figure 2. Weller, R. (2005). Recent excavations at the Haven Site (33DL1448) and the Knowlton site (33DL1450). 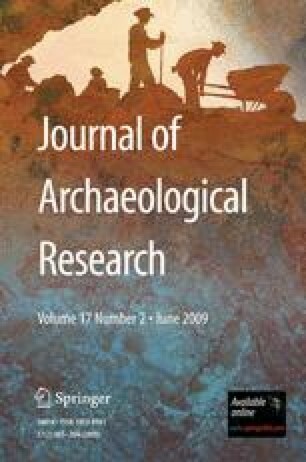 Current Research in Ohio Archaeology 2005. Available at http://www.ohioarchaeology.org. [accessed January 2007].